Just wanted to share an application of Tindebrox which is still in the works, but proves to be quite useful for me: Gardening. Basically i created a note for every plant in our garden, and arranged them onto a map representing more or less the shape and location of our beds, trees, buildings etc. In the future i plan to add also some observations-info about how different plants react best to what places in the garden (sunshine/wind exposure/soil etc.). What a wonderful application! It takes advantage of the representational value of maps and structure on many levels and should be a very useful tool for you. Have you constructed any HTML or text exports? Perhaps someday we can see the whole document on the Tinderbox exchange? Yes, it has become very useful for me, simply because i'm a beginner in gardening and tend therefor to forget about some stuff. And besides that its a bit like writing my own "Garden-Experience/History noteboook". So far i haven't done any exports, over time when theres more information for some plants that might become useful i guess. Perhaps someday we can see the whole document on the Tinderbox exchange? what an astounding coincidence! I am putting together a Tinderbox document for exactly the same purpose. For now, I am taking digital pictures each week and take notes of flowering times, colour, soil, moisture etc. Some areas of our garden are rich in plant species but the temporal sequence is not well harmonized. Yes, taking pictures migth be interesting for me as well ... and i plan - over the years - to harmonize the temporal sequence with the help of tinderbox as well. Google Earth won't work well for me, the resolution of the image where i live simply isn't good enough to make any sense. And i will be happy to write here more about my experiences with it, as well as to read yours How do you plan to use the images of the plants in the Tinderbox-project? for the moment I only use the images to note flowering times and colours. The images are also quite useful for something that cannot be transformed into variables such as how "complete" a specific area of the garden looks, if it visually competes with other areas but that is a side aspect I haven't put much thought into. They are just useful to have I guess and besides, I like to take the pictures. Just like I enjoy working in the garden, that's the whole point. My Tinderbox document is much less sophisiticated than yours presumably, different containers for different parts of the garden, a couple of agents summarizing flowering times and things to do and when. The work I still have to do myself, I simply could not make a Tinderbox agent go out and actually harvest my cherries. Syntax problem if you ask me. I've used the amazing Edible Forest Gardens Vol II, by Dave Jacke, as my main source for plant info. In the future I think I'll use base maps (or Google Earth images) as background for placing the agents in spatial relationship. What I REALLY want, long term, is to figure out how to export a given collection of notes, representing a master plant list, in a useful spreadsheet-style format. I'm just not there yet in my tinderbox acumen. If only somebody would pay me to do TBX fulltime! It won't replace your main source of income, but we'd be very interested in a case study or screencast, or maybe a series, on Tinderbox for gardening and allied tasks. Maybe a profile article interviewing the people in this discussion. Rafter, if you've some specimen data and a slightly more detailed description of what you want in the spreadsheet I'm sure I can help with the spreadsheet export. TB can certainly export - for instance - a tab-delimited text file such as Excel can read - though at worst we might need to tweak the internal format with a re-save in something (free) like TextWrangler. The latter would only be necessary if the default export from TB wasn't readable into Excel - under the hood not all 'text' is the same, even supposed 'plain text'. As ever the Devil's in the detail...the exact template depends on what you're trying to do. By all means drop me an email to discuss detail lest this get into a long divergent thread**; no liability except I'd like to be able to share the broad details with the TB community when done. ** I think previous readers misunderstood my post. I was merely trying to avoid a narrow technical issue of data export technique getting cross-threaded with the wider topic and TB, Gradening. etc. Many user's prefer not to pass complete personal source (TBX) data to a public - thus the offer of looking at it privately. Indeed the whole point was to look for things from that to share back with the TB community in suitably sanitised form. Oh well, no good deed goes unpunished! "... lest this get into a long thread"
Why not let this develop into a lively discussion between all interested parties? Sometimes it is more inspiring to seek the tools (with the help of all the friendly people here on this forum) when one is really interested in getting it to work the way one wants to rather than being presented a solution up front. The shared joy of finally getting it right as well as sparking some unexpected ideas along the way is the whole idea behind a forum, is it not? Christoph, no problem at all. I didn't mean to stop discussion of the Gardening & TB but simply avoid the narrower tech point of exporting data for spreadsheet use getting interwoven, especially if sorting one particular persons exports neds (i.e. exact attribute names, etc). 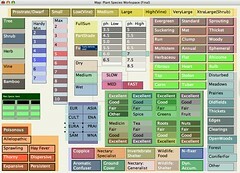 Anyway, since my last post here and for anyone interested in export for spreadsheets, I've already posted a specimen file (linked via a new topic) that will show how to go about export to tab-delimited or CSV text file; that topic will let discussion of the fine detail of export not interrupt this interesting thread on TB, gardening and plants. I agree; there's nothing wrong with long threads. It might be useful, as this excellent discussion progresses, to extract the ideas to a page on the Tinderbox Wiki. This is also true of some of the interesting recent discussions, for example, on Tinderbox for planning novels. I'll be creating/tweaking agent prototypes over the next couple weeks, and I think I'll be ready to share more at that time. I just finished implementing the first landscape I designed using Tinderbox as a design tool! ...or just enter them into an excel worksheet, formatted appropriately, and then import from excel into Tbx. The nice thing about the graphic/adornment workflow is that I can enter plant info one handed, so I can follow along a long spreadsheet row with my finger, and not mix up date between rows. I should do a test run, and see which is faster for entering a page of information. I'd would love some help! What I'd like is to have a few standard templates, with different selections of attributes. I would want to be able to import a file to excel, that would then have the first column of all plant names, and then the cells of each row comprised of characteristics of that plant (that are values from user attributes). How does one email you, if one wants to share samples and specifications?